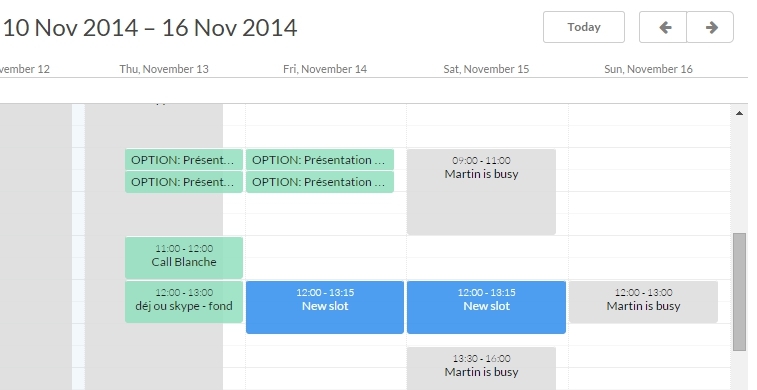 Today, we’re introducing a new important feature to vyte.in, your personal meeting assistant : Calendar sharing! For now, this feature is only available on desktops and tablets and will soon be available on smartphones. Until now, when you clicked on Suggest dates, vyte.in used to open your Google calendar, to let you see in detail all your already scheduled meetings. Henceforth, vyte.in displays also your invitee’s availability (for those who are already vyte.in users). You cannot see the details of their schedule, but it is easy to see when they are busy and when they are available. In the same way, after sending your vyte.in, your availability is shown to the participants in terms of “busy” or “available”. They can easily suggest new relevant dates if needed. If various invitees are busy for a give time slot, vyte.in aggregates the information (for example : 3 busy). You just have to click on the given time slot to know the identity of the busy invitees. With your detailed schedule and the rough availability of your invitees displayed to you, it is very simple to suggest time slots that are likely to be convenient for everyone. When everyone has voted, you just have to confirm the best date and place in one click. Everyone receives the final meeting directly in their calendar. Do you like this new feature? Do you have a meeting to plan? Save time and plan a meeting now! App review|How to rate an app on Google Apps Marketplace?